So here you are with the Lenovo YOGA Tab 3 Pro tablet. The slate comes with a Pico projector, and there is a great movie that you want to show your friends. So you gather at the park, knowing that the 10,200mAh battery inside the tablet will keep you up and running for up to 18 hours. Everything seems to be in place for a good time, except for one little detail. What are you going to project the movie on? Luckily, you have the answer. You take off the jacket that you've been wearing (which everyone has been complementing you on), and turn it inside out. You use the included hooks to stretch it out and attach it to a fence. And lo and behold, the Lenovo Screen Jacket has turned into the perfect companion for the YOGA Tab 3 Pro slate. When reversed, the jacket becomes a movie screen measuring 47-inches long and 24-inches tall. At $383, it is nearly as costly as the tablet itself. Speaking about the Lenovo YOGA Tab 3 Pro, the tablet was unveiled in September and was launched two months later. To refresh your memory, it features a 10.1-inch LCD screen with a 1600 x 2560 resolution, resulting in a 299ppi pixel density. Under the hood is the 64-bit Intel Atom X5-Z8500 chipset, carrying a quad-core 2.24GHz CPU. 2GB of RAM is inside along with 32GB of native storage. Those seeking additional memory can access the 128GB capacity microSD slot. A 13MP camera sans flash adorns the back, with a 5MP camera in front to shoot selfies and handle video chats. Android 5.1 is pre-installed. Unveiled today by Lenovo France, the Screen Jacket can go everywhere that you take the Lenovo YOGA Tab 3 Pro. 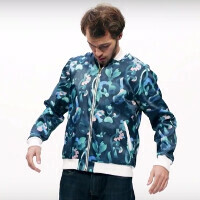 And with jackets designed by names like Felipe Pantone, Janine Rewell, JeanSpezial and Yogo Honda, it is snazzy enough to wear even when you leave your tablet at home. Before watching the video, i was thinking what crap is this, after watching hmm... interesting concept. Of course, Lenovo don't have Apple marketing ingenuity so it still would be a hard sell. Lol a smart jacket would be cooler. But then you will also have to wait until nightime. You can't see jack from the projector in daylight... jacket or otherwise.